I cannot say I had as much "fun" as my wife claims, but it was a good day. Better yet, it got completed. I am not so good at the drawn out projects. Your mail box looks like it has chicken pox or something. please add to the list of things NOT to joke be about on the blog below: my mailbox!!! 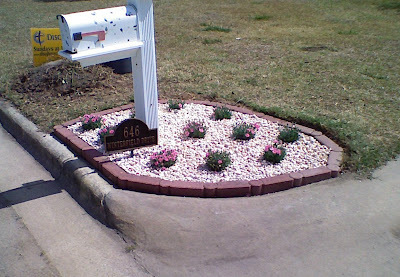 The flower bed looks great. Please don't show my wife. 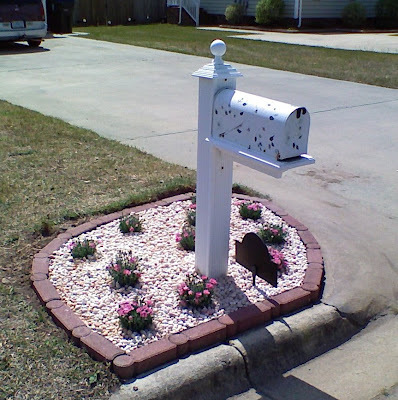 My mailbox flower bed is still a dirt pile...a pretty dirt pile...but still a dirt pile. We need to fix up our mailbox! Randy has all of the stuff in his shed- we just have to get out there and do it!! Ours spins in complete circles right now lol!! Saves money on one of those chicken looking things that go on the tops of barns that points which direction the wind is blowing! Hello?! Come on Laci. Just trying to be a good steward.